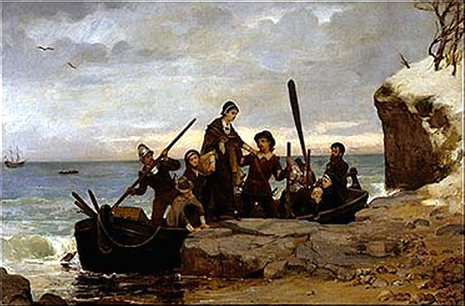 On December 21, 1620, the first landing party arrived at the site of what would become the settlement of Plymouth. Plans to immediately begin building houses, however, were delayed by inclement weather until December 23. As the building progressed, twenty men always remained ashore for security purposes, while the rest of the work crews returned each night to the Mayflower. 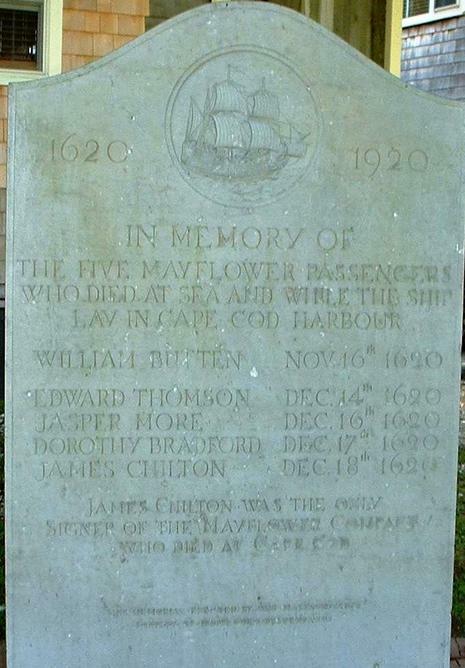 Women, children, and the infirm remained on board the Mayflower; many had not left the ship for six months. The first structure, a "common house" of wattle and daub, took two weeks to complete in the harsh New England winter. In the following weeks, the rest of the settlement slowly took shape. The living and working structures were built on the relatively flat top of Cole's Hill, and a wooden platform was constructed to support the cannon that would defend the settlement from nearby Fort Hill. Many of the able-bodied men were too infirm to work, and some died of their illnesses. Thus, only seven residences (of a planned nineteen) and four common houses were constructed during the first winter. Anyone who arrived in Plymouth on Mayflower and survived the initial hardships is now considered a Pilgrim with no distinction being made on the basis of their original purposes for making the voyage.